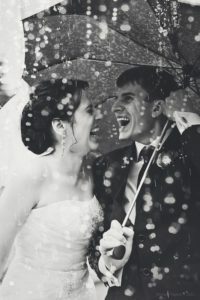 When most brides think of rain on their wedding day, they go into a panic. However, a little rain (or a lot) doesn’t mean everything will be ruined and it definitely doesn’t mean your wedding will be any less special. Rain won’t keep you from marrying your sweetheart and it won’t keep the love from shining all day long. If your wedding day forecast is looking rainy, don’t worry. 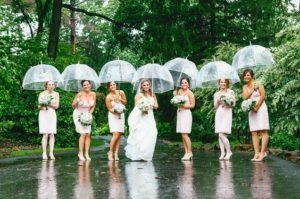 Rain can actually make your special day more dramatic and memorable, and here are 8 tips to make the most of it. If you’re at all worried about rain on your wedding day, it is best to just choose an indoor reception from the start of the planning process. This way, you don’t have to go with the “backup plan” and nothing has to change at the last moment. An indoor reception is just as beautiful as an outdoor one and you can plan it and decorate it exactly as you like without having to worry about any decor getting rained on. All you have to do is some browsing on Pinterest and you’ll see that rain on a wedding day can actually provide for some pretty spectacular pictures. Talk with your photographer ahead of time and let him/her know that if it rains, you’d love to take advantage of it. Some photographers may be more willing than others to shoot in the rain so make sure they are willing to and have the necessary equipment. Silhouette shots of you and your new hubby with dramatic lighting playing on all of the rain drops.. Gorgeous! No bride wants to walk around in puddles in her fancy high heels. When you’re moving between the ceremony and reception, or during pictures, wear some cute rain boots you picked out specially for your wedding. They will make for super cute photos as well! Rain, humidity, and long hair don’t mix. The last thing a bride will want to see looking back at their wedding pictures is a head full of frizz. And the only real way to combat fuzzy hair is to avoid wearing it down and instead choosing an updo or pinned braid. Add flowers or a jeweled clip to add some pizzazz and keep any hair out of your face and from frizzing up. If bright, sunny pictures outside have always been in your dreams for your wedding, then there is nothing wrong with doing a photo shoot before the actual day or after your wedding when the weather is more cooperative. You can still have the sunny pictures, and stay totally dry, like you always imagined with your lover boy. If you do have a reception or cocktail hour outside under a tent, be sure to remember to stash some towels nearby so you can dry off the seats. Guests won’t want to sit in rain puddles while they eat dinner and neither will you with your white dress! Towels will also come in handy when you and your bridesmaids want to dry off your lower legs and feet before entering into your reception. Umbrellas can actually make for really fun bridal pictures, especially if they’re all matching. You can get all your bridesmaids matching umbrellas and choose a special one for you to stand out. Your maids will definitely appreciate it because chances are they’ll forget theirs, or they may feel that you wouldn’t want them to use their own in pictures for fear of ruining the shot. But you can combat any worry and create really fun group shots by surprising your girls with wedding umbrellas. The most important thing to remember if your wedding is rainy isn’t the perfect umbrella or rain boots; it’s your attitude. At the end of the day, it is your wedding and you need to make the best of it, rain or shine. Smile, have fun and allow yourself to get swept into the nuptial bliss of your wedding alongside your new spouse. You won’t regret a thing if you keep your attitude bright and sunny. Nothing should come between a bride and her perfect wedding. And rain definitely shouldn’t! Follow our tips and remember that your attitude will be the most important factor of your happiness. If you’re looking for a beautiful indoor venue for your wedding so rain never even needs to be a thought, check out Hollywood Banquet Hall in Los Angeles.